President Donald Trump's executive order on sanctuary cities that protect immigrants could cut federal funding for Washington, D.C. public schools and the city departments that serve homeless people, domestic violence victims and people with HIV. At least $1 billion in federal grants that D.C. receives is vulnerable under the executive order Trump signed Wednesday to punish locales that "willfully violate federal law in an attempt to shield aliens from removal from the United States." There's no question that D.C. is a sanctuary city. The District issues provisional driver's licenses to illegal residents, police do not ask about residency status, and earlier this month Mayor Muriel Bowser announced the creation of a legal defense fund to help immigrants. D.C. had this federal grant funding in financial year 2017. D.C. is reliant upon the federal government for a total of $3.5 billion in federal grants in financial year 2017. City officials believe the administration would not cut the majority of those funds because they cover Medicaid reimbursements, plus law enforcement costs, which are exempt under the order. But $1 billion in federal funding is still vulnerable, according to an analysis of 2017 data from the D.C. Office of the Chief Financial Officer. -- The D.C. Department of Health, at $128.2 million. D.C. Councilmember Jack Evans, the chair of the finance committee said the District cannot afford any cuts. "It would be catastrophic for us, to be honest with you. We don't have that kind of money," he said. The cuts could affect programs "to help people in need," he continued. D.C. police and other city officials serve people without regard to their immigration status. Deputy Mayor for Public Safety and Justice Kevin Donahue said D.C. is acting not just on principle, but to protect public safety. The city argues that immigrants in the U.S. illegally should not be afraid to call 911 in an emergency or to report information about a crime. If the U.S. Department of Homeland Security (DHS) seeks to detain someone who is in D.C. custody, D.C. will inform DHS of that person's release within two days, not continue to detain him or her, Donahue said. The deputy mayor said the city is prepared to fight Trump's order in court. "The lawyers in the city, both for the mayor and with the attorney general, are looking at this order, and I would say mayors and governors across the country are as well," he said. "They have, just on first impression, deep reservations about some of the legality of even following through with the intent of the executive order." 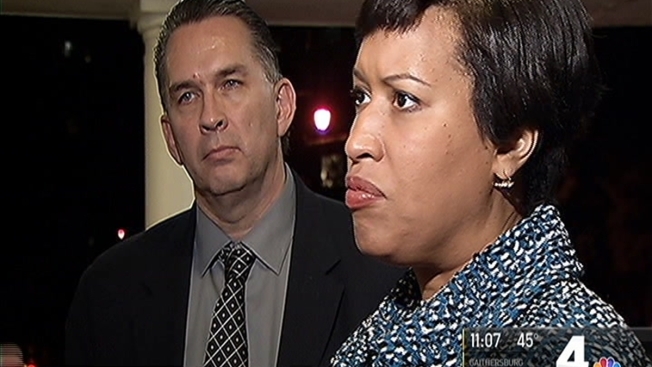 Mayor Muriel Bowser reiterated that statement Thursday night. "What we're really focused on, there's a lot of ambiguity in the executive order and so now it's our job to work with the department of homeland security," Bowser said. Officials are waiting for clarification from the White House and Congress on the ramifications of the order. D.C. Councilman David Grosso said he believes the District needs to continue to protect immigrants. "I think we have to stand by our principles in this time period and really recognize that this is not going to last forever," he said.